A little while ago my friend Chili Ron showed me a stainless-steel large-frame Ruger Vaquero that came with two cylinders; one in .45 LC (Long Colt), and a second one in .45 ACP (Automatic Colt Pistol). I thought that was a great idea, and I’m a big fan of convertible revolvers. I own two Ruger Single Six convertible revolvers that came with two cylinders; one for .22 short/long/long rifle, and a second one for .22 magnum. 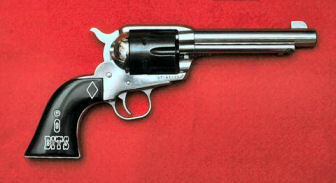 I converted one of those Single Six revolvers into a trail gun, refer to my article Building the Ultimate .22 Trail Gun. I thought it would be fun to shoot .45 ACP out of my Ruger large-frame .45 LC Vaqueros, not to mention the lighter rounds would be good for cowboy action shooting. .45 ACP is the caliber also used for Wild Bunch matches in 1911 pistols. I found a Ruger .45 ACP cylinder on eBay that came from an old-model Blackhawk for a fairly reasonable price. Ruger used to provide their extra cylinders in a red felt bag; the spare cylinder for my Single-Six liberty gun had one. The problem with these bags was that they absorbed moisture. Most people never removed the spare cylinder from the bag so eventually the cylinder developed rust as you can see from the above photo. This cylinder had been fired, but never cleaned; I hate working on dirty guns. If I were a professional gunsmith I would charge an extra $40 just for cleaning! I soaked a cleaning patch in Ed’s Red and liberally swabbed each chamber. I then put a .45 caliber bronze cleaning brush on the end of an aluminum rifle cleaning rod segment and chucked the rod into my cordless drill. I ran the drill at a slow RPM and moved the brush in and out of each chamber. Years of dried, caked on power residue came off in my hand. I dried each chamber and coated each one with Breakfree CLP. I tried fitting the cylinder into my .45 LC Bisley Blackhawk but it just wouldn’t fit. After some careful examination I discovered that the .45 ACP cylinder was longer than the Blackhawk cylinder. This was because the rims of .45 LC cases sat above the rear face of the Blackhawk cylinder, but .45 ACP cases sit flush and even with the rear of the .45 ACP cylinder. The cylinder had to be longer so the firing pin could reach the primers. 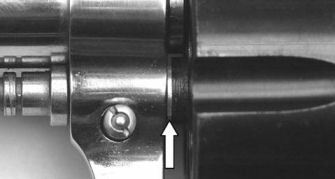 The rear outside edge of the .45 ACP cylinder was hitting a raised ridge left in the rear bottom corner of the frame as shown in the above photo. This ridge was obviously left over from the manufacturing process. Both of my Vaqueros had this same ridge. I carefully filed off the ridge with a safe-edge file until the corner was square and the edges were flat. Now the cylinder fit into the frame and rotated freely. The diameter of the ratchet for the .45 ACP cylinder measured 0.611”, but the diameter of the ratchet for my Vaqueros and new model Blackhawks measured 0.560”. Although the cylinder functioned properly, and was timed properly, my homemade free spin pawls no longer worked. (Refer to my article Making a Free Spin Pawl for a Ruger® Single-Action Revolver.) The ratchet was so wide it was still engaging the top tooth of the pawl. The front pivot on the cylinder measured 0.435” wide by 0.095” high, so I milled a 0.436” hole 0.100” deep in a piece of aluminum I had set up and leveled for another project. I set the cylinder in the hole with the ratchet facing up and secured the cylinder in place. I carefully centered the mill and milled the outside of the ratchet. I milled down 0.100” because I didn’t want to touch the face of the cylinder. This left a small raised ring of metal around the ratchet, but this does not interfere with the cylinder. After the milling was completed I cold-blued the exposed metal. The cylinder now functioned perfectly just like my other cylinders. Although the cylinder now fit into the frame, there was a large gap between the frame and the end of the cylinder. This is called “end shake” and when it is pronounced like this will cause the front of the cylinder to rub against the rear of the barrel and possible misfires caused by the cylinder moving away from the firing pin. This gap measured 0.030” so I fabricated an end shake shim to keep the cylinder in position. I took a piece of 3/64” tool steel and milled it down to 0.030”, then milled out the shim with my hobby CNC mill. The center hole measured 0.270” and the outside diameter was 0.436”. I polished the side of the shim that rotated against the frame with 1,000-grit paper to make it very smooth. The end shake shim fit perfectly; it allowed the cylinder to rotate freely with just a hint of front-to-back movement. To hold the new shim in place I used a toothpick to spread a thin layer of superglue gel on the surface of the shim and set it in place onto the front of the cylinder. I prefer using the gel because it doesn’t run all over the place like the liquid does. I ran a piece of 1/4-20 threaded rod through the pivot hole and snugged a 1/4“ washer and nut on each end. I left the nuts and washers in place for 24 hours to allow the adhesive to set up. Now I can install and remove the cylinder in the frame without having to worry about losing the end shake shim. So now I have one Vaquero with an interchangeable .45 ACP cylinder. The cylinder did require some minor fitting. I really didn’t have to reduce the circumference of the ratchet, it would have worked perfectly well in an unmodified Vaquero, but it wouldn’t work with my homemade free-spin pawls. I also didn’t have to fabricate the end shake shim; Brownells sells a 10-pack of 0.0045” Single Action Revolver Gas Ring Shims #713-000-080 which I could have stacked to fit. Now all I have to do is polish out and remove all the pitting left from the rust and refinish the cylinder. This will be another article. It wasn’t any more than a week after I published this article that another Blackhawk .45 ACP cylinder appeared on ebay. My friend Chili Ron was right; they do show up regularly! This one fit in my second Vaquero almost perfectly, and the blued finish was flawless with no rust. Because it had been fired it had the drag ring around the outside, but unlike the first cylinder this one had been cleaned. The ratchet measured 0.577” and was just barely touching the top tooth of my homemade free-spin pawl. I reduced the diameter of the ratchet to 0.560” and cold blued it to match my other cylinders. This second cylinder was shorter than the first one; the rims of the .45 ACP cartridges sat above the rear face of the cylinder rather than flush like the first cylinder I purchased. Both cylinders in the above photo have a cartridge in one of the chambers, but the rim of the cartridge is exposed in the right cylinder. I drilled and tapped a 1/4-20 hole in the center of the 0.436” hole I milled in my jig. I mounted the first cylinder in that hole with the ratchet up and secured it with a 1/4-20 rod and a nut. 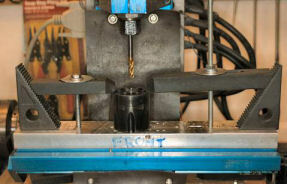 I milled 0.038” off the rear face of the first cylinder so the rims of the cartridges would sit above the cylinder face like the second cylinder. This left a lot of bare metal exposed but I plan to refinish this cylinder anyway. I beveled the rear edge of the cylinder, and chamfered the chambers to remove the sharp edges left from the milling process. The raised rims make it easier for the loading marshal to see an empty chamber during a cowboy match. 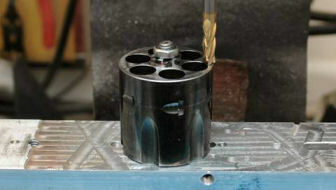 It is almost impossible to see an empty chamber if the cartridge rim sits flush with the rear face of the cylinder. There was a 0.014” end shake gap so I had to fabricate an end shake shim like I did before. The shim I fabricated was just a bit too thick so I polished it with 400-grit wet/dry sand paper until the cylinder rotated freely. I again used superglue gel to hold the shim in place. I took an electric engraver and engraved the last three digits of the Vaquero’s serial number on the front face of each cylinder similar to the way Ruger does at the factory so I can tell which cylinder goes with which gun. Now both of my Vaqueros have a .45 ACP conversion cylinder.